For starters, Seth Griffith shouldn’t be here. Seventh career NHL game, playing on the Bruins’ top line, his name nowhere to be found in any season projection of the team’s lineup. But here he is, and he’s surrounded by a media scrum that should be much larger given the circumstances. Griffith’s speaks at a hushed volume. His answers are brief and in monotone, not something you’d expect from a rookie who recorded his first multi-point game, scoring two goals and adding an assist. It’s a sullen Bruins locker room after the team blew a 3-1 lead in the third period and ended up losing Tuesday night’s game against the Minnesota Wild, 4-3. That’ll be the focus, of course. The Bruins inability to carry momentum, giving up late rushes, and the mismanagement of the puck all contributed to what should have been a night about Seth Griffith’s play. “That’s probably the brightest thing of the night for us,”said Bruins coach Claude Julien. “The fact that Seth really played a strong game. That line last year scored a lot of goals from guys driving the net and he did a great job of driving the net every time. He got rewarded for it and he also made a nice play there on Lucic’s goal. Griffith benefited from two give-and-go plays on his goals, the Bruins’ first and second of the night. For his first, David Krejci found Griffith streaking to the net and put the puck perfectly on his tape for the tip-in. On his second, Gregory Campbell patiently waited for Wild defenseman Marco Scandella to make the first move before sliding the puck to Griffith who, flying through the air, scored his third goal of the season. He later added a secondary assist on Milan Lucic’s power play goal before things fell apart for the Bruins. They didn’t at all, which is a shame because tonight would have been a great night to focus on Griffith’s somewhat rapid ascension into the NHL, rather than the Bruins overwhelming deficiencies. Griffith was overlooked as an option to make the Bruins at the beginning of the season. It was assumed that Loui Eriksson would take the top spot on the first line, with Matt Fraser playing on the third, and who knows on the fourth. But when Reilly Smith wasn’t immediately signed at the beginning of training camp, Griffith saw time playing with Patrice Bergeron and Brad Marchand on the right wing. From there, Griffith became an actual option to make the Bruins’ roster. The Bruins needed a winger with a right-handed shot who could replace the void that was first left by Nathan Horton and then Jarome Iginla the following season. The Bruins needed a player that they could slot into the right wing alongside Lucic and Krejci that would be able to shoot fast and crash the net hard. While it was projected to be Eriksson, the chemistry he had on a line with Chris Kelly and Carl Soderberg was enough for Julien to see and not make any changes. Griffith was recalled on October 12 in time for the Bruins’ third game of the regular season and in stride with Krejci’s season debut. He was put on the top line right away and aside from a DNP against Buffalo on October 18, has stuck alongside both Krejci and Lucic. Both of his linemates commented on Griffith’s play and how he has been fitting in well with the two of them. 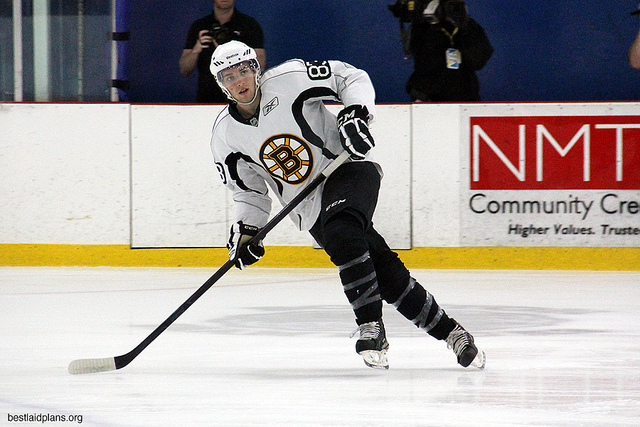 In Griffith’s rookie year with the AHL’s Providence Bruins last season, the 2012 5th round pick recorded 20 goals and 30 assists in 69 games. Only Alexander Khokhlachev had more points. So a rookie, playing on the Bruins’ top line, has a three-point night in his seventh career game and it’s not the big story. In the bigger picture, this is the Bruins’ problem and one that keeps reappearing. We could talk about that more, or we could talk about the one player who shouldn’t have been on the Bruins roster, let alone the first line, at this point in the season. Especially since he shouldn’t have been one of the few Bruins to actually show up on Tuesday night. Follow Mike Miccoli on Twitter for more Bruins updates, news, and commentary.